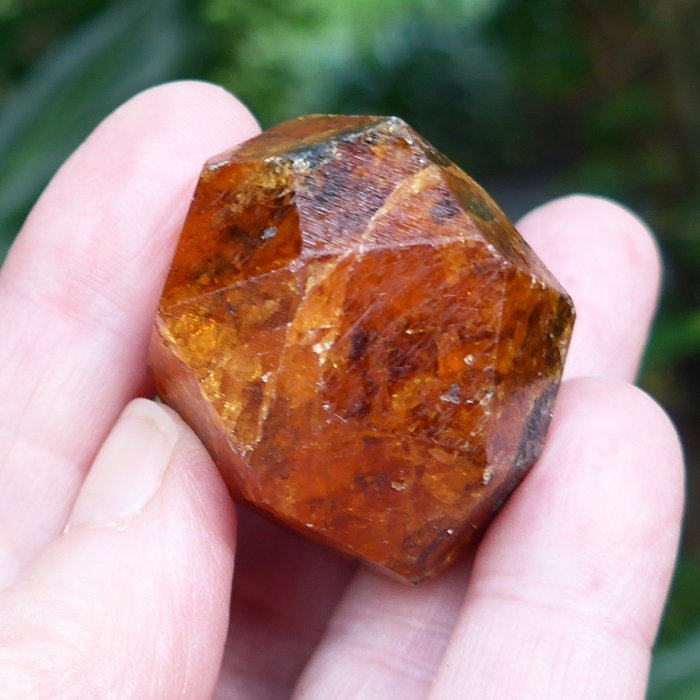 Dimensions (HxWxD): 1.375" x 1.375" x 1.185"
This translucent 1.375 inch diameter, 340 carat all-natural, untreated AAA quality Orange Giant Spessartine Garnet from Tanzania has brilliant inner fire, clearly visible in the accompanying pictures. 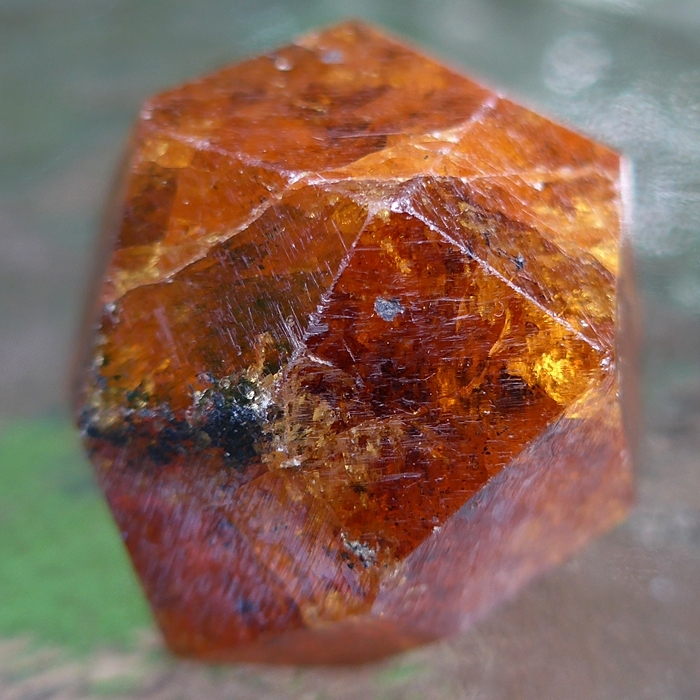 These Orange garnet gemstones have 24 kite-shaped facets, and come from Loliondo, Tazmania. They were mined toward the end of 2007, and first appeared on the global gem market at the Tucson show in January 2008. Gems & Gemology magazine published a story on these amazing garnets -- which have captivated collectors worldwide. The vast vast majority, well over 90% of this material, had abundant dark inclusions, which appear to the naked eye to be braunite. These are high manganese and low hematite specimens, so the inclusions are definitely NOT hematite or any iron based material. This garnet has abundant inclusions and also sparkling inner highlights marking this as a high grade specimen. 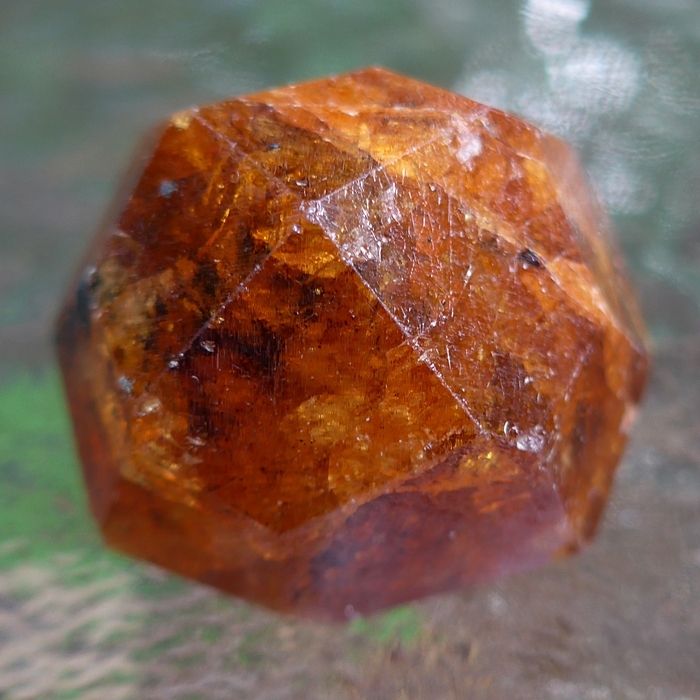 Spessartine garnets are vitreous, translucent hexocatahedral gemstones with a hardness rated significantly above quartz crystal, characterized by the presence of aluminum and manganese, which imparts their striking reddish orange color. Garnets were traditionally considered stones of protection in both the Middle East and European spiritual traditions, used to ward off demons and evil environmental influences, and to protect warriors in battle. Garnets were also used as stones of sexual healing, to promote passionate connection between loving partners. Most of all, garnets are the quintessential stone of prosperity, used to manifest abundant wealth and income for millennia in cultures around the world. All these properties are connected to the garnet's connection to the root chakra, which is colored red in the Western chakra system, and which governs issues of survival, adequate prosperity to sustain life, and sexual energy. The root chakra is the site of the coiled kundalini energy which is the fountainhead of all spiritual experiences, and thus the garnet is also thought to awaken the kundalini energy which normally lies dormant in human beings until awakened by a spiritual teacher or by intense spiritual experience of some kind. Experienced crystal healers and Lightworkers familiar with these unique garnets tell us that they activate and energize the second chakra, which is considered to be orange in color in the Western chakra system. The second chakra governs the genital organs and lower abdomen, and is connected with sexuality, vitality, personal magnetism, and personal affluence. We have talked with both a major dealer in African gemstones and with well-known crystal healers, who have discovered from personal experience that these Spessartine garnets act as magnets for money as well as potent activators of personal magnetism, increasing one's charisma and making the bearer more attractive in the eyes of potential sexual partners and existing love relations. 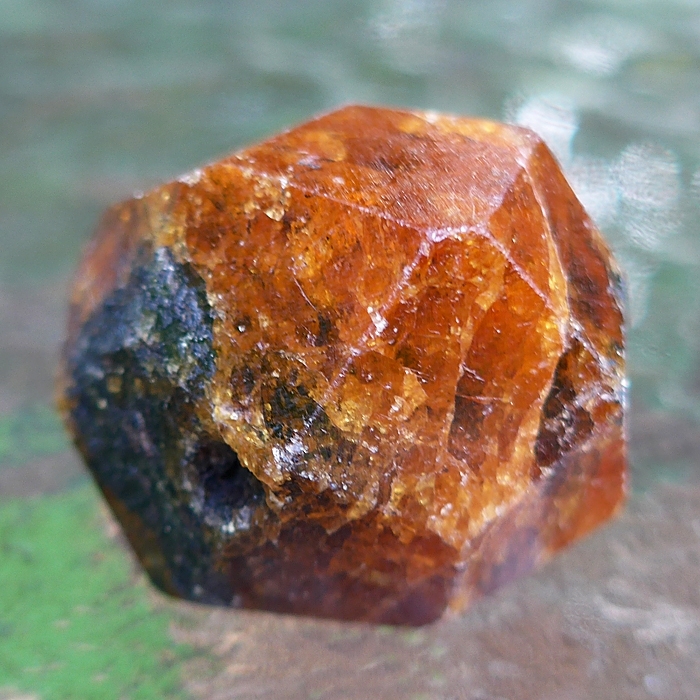 We have been guided to tell you that the bearer can expect to attract wealth and abundance and to become more attractive personally, so be careful not to squander money that comes to you or to abuse the personal magnetism that you are sure to feel when carrying one of these garnets, or when using one of them in meditation or on your altar! Jane and I feel these Tanzanian orange fire garnets are among the most intense natural, uncut, untreated gemstones we've used for meditation and energy work. 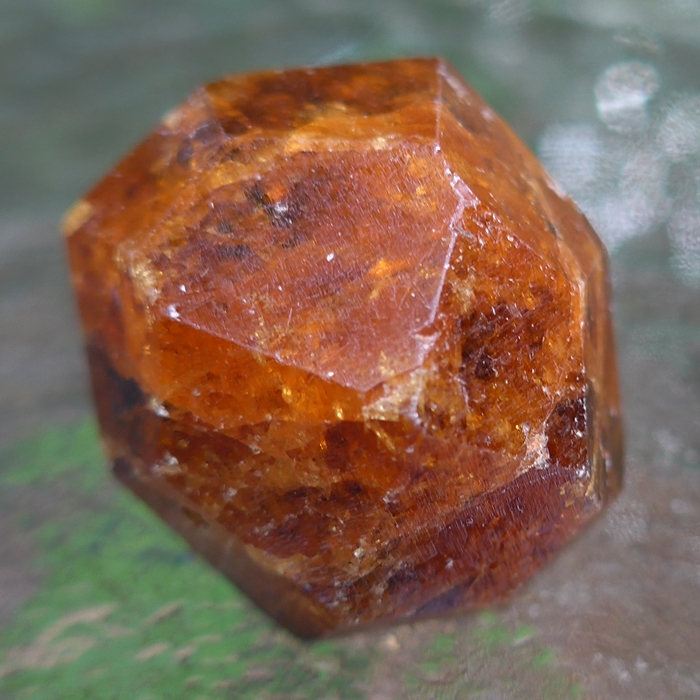 Jane and I have used spessartine garnets in Reiki treatments on ourselves and with clients, and have found that this is one of the most powerful crystals we have ever used to enhance the flow of universal life force energy, "chi", or "prana" in the body. Note: Above weight is shipping weight. Net weight is 340 carats, 2.4 ounces, or 68 grams.